Topcats fishery is set on the idyllic tropical island paradise of Koh Samui in the province of Surrathani , Southern Thailand. The Topcats resort and fishery in Koh Samui covers an area of some six acres with a 4.5 acre specimen lake stocked with various freshwater species both native and imported to Thailand. The resort is nestled amongst a lush jungle setting surrounded by palm trees and other flora and fauna commanding spectacular views across the nearby mountains. 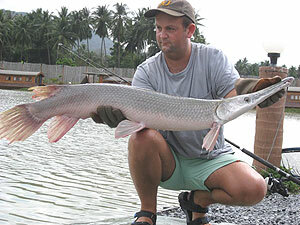 Topcats boasts an impressive stocking of a wide range of predatory species including the awesome Arapaima gigas, Redtail catfish, Sorubim, Alligator Gar in addition to native predatory species such as Chaophraya Catfish and Giant Snakehead. The fishery has been subject to several stockings of various monster fish species and has produced several fish of world record size. Top cats specimen fishery is home to the Niger ‘Ripsaw’ catfish with several fish present to a record breaking 38lb/17.25kg. Topcats is the only fishery in the world stocked with the much sought after Amazonian Niger Catfish holding several specimens in excess of the current world record. 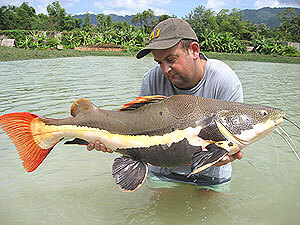 In addition Top cats fishery has some of the largest Redtail catfish in the world with specimens captured by the Fishsiam team upto 44.5kg/97lb+. 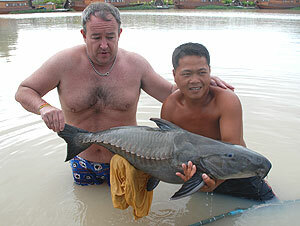 Top cats fishery also holds Giant Siamese Carp to 29kg/65lb+ in addition to various other Asian carp species such as Rohu and the highly elusive Julien’s Golden prize Carp. Top cats is a highly prolific mixed species fishery capable of producing big hauls of large monster fish species on a regular basis with the chance of a world record fish a distinct possibility. Top cats boasts an impressive range of facilities with authentic teak rice barges (air-conditioned) offering high class accommodation for the visiting angler(s). A large restaurant serving a wide selection of food (English chef) and well stocked bar add to this unique angling resort and experience. Fishsiam is an official booking agent for Top cats fishery based in Thailand and has sent lots of happy clients to this lovely venue in recent years. Being located on one of the countries premier holiday islands means visitors to this venue will have a host of tourist attractions and relaxation opportunities to keep non fishing companions content. This venue can be combined with other destinations in our angling portfolio to cater for the discerning anglers exact holiday requirements.